Andhra Pradesh Chief Minister N Chandrababu Naidu took out a protest march in Delhi demanding special status for his state. All the MPs, MLAs and MLCs of his Telugu Desam Party (TDP) will take part in the march that began from the Andhra Pradesh Bhavan and ended at Jantar Mantar. Naidu has alleged that the Narendra Modi government has gone back on its promise and also from the commitment made by the previous regime during the passage of the Andhra Pradesh Reorganisation Act, 2014. The law provided for bifurcation of Andhra Pradesh and creation of Telangana as a separate state. 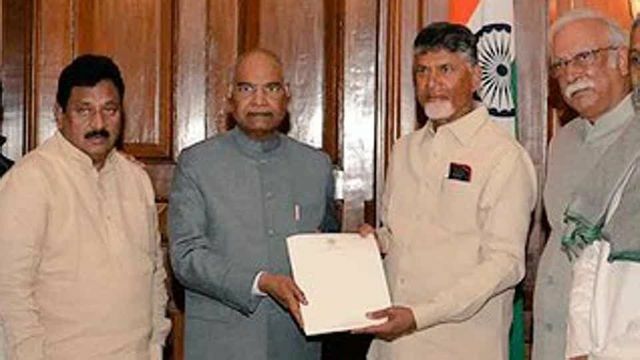 Following the protest march, the Andhra Pradesh chief minister and TDP legislators met President Ram Nath Kovind at the Rashtrapati Bhavan and submitted a memorandum seeking special status for Andhra Pradesh. Naidu. The memorandum to President Kovind talks about the status of implementation of assurances made in the parliament during the passing of the state reorganisation legislation.